Chef-Owner Carlos Swepson uses his French culinary training to riff on soul food staples. 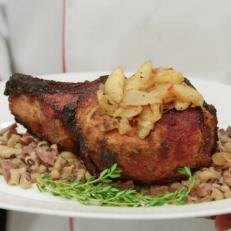 The mouthwatering results include the Double Cut Pork Chop. For this signature dish, a 20-ounce pork chop is rubbed with a spicy-sweet mixture and seared to seal in the meat’s natural flavor. The chop is roasted until tender, then smothered with a sauteed onion-and-apple mixture and nestled on a bed of rich black-eyed peas.